In the modern day world cryptography is used to create coins and secure transactions. Crypto currency is a form of digital currency that works as a medium of exchange. It runs on blockchain technology and is used to secure the transactions as well as to verify transfer of assets. Bitcoin is the most commonly known crypto-currency which was created in 2009 by Satoshi Nakamoto. Apart from Bitcoin there are hundreds of other virtual currencies. Often referred to as Altcoin, some other crypto currencies are Ethereum’s Ether, Litecoin, Ripple, Augur etc. ‘Crypto currency’ as the name suggests is a virtual currency that uses cryptography for security reasons making it difficult to forge. What once started as a humble beginning has come a far way now as cryptocurrency have taken over the world. Everyone is talking, investing and trading in them. Easy To Transfer – With crypto-currencies, it is easier to transfer funds from one party to another. The whole process is quicker and less costly as processing fee is minimal. Also, it has facilitated immediate settlements. Can’t be Counterfeited Easily – There is no need to worry at all as crypto-currencies are virtual. They cannot be counterfeited easily which in turn minimizes the risk of fraud. Access To Everyone – People who have access to internet or mobile phones can own their cryptocurrency wallet and leverage the benefit from anywhere round the world. Universal – Though each country is coming up with their own guidelines for Crypto-currencies, they can be operated universally as they are not bound by exchange rates, interest rates etc. of one specific country. Highly Secured – You are not required to share any personal or transactional details. Create a proxy ID to prevent theft of your sensitive and confidential data. Buy Goods – A lot of merchants now accept crypto-currencies as a mode of payment. So you can use them to buy goods. Invest – Though investing in Cryptocurrencies is considered as a risky preposition, people worldwide are putting their money in it. For some, it has proved to be a great investment opportunity as people who invested in cryptocurrencies at the right time have made millions out of it. Given the advantages and the growing popularity, cryptocurrencies have a bright future and tremendous potential of growth in near future. They have opened up a plethora of new opportunities, brought along a revolutionary change in the market and are expected to become a part of mainstream financial system very soon. 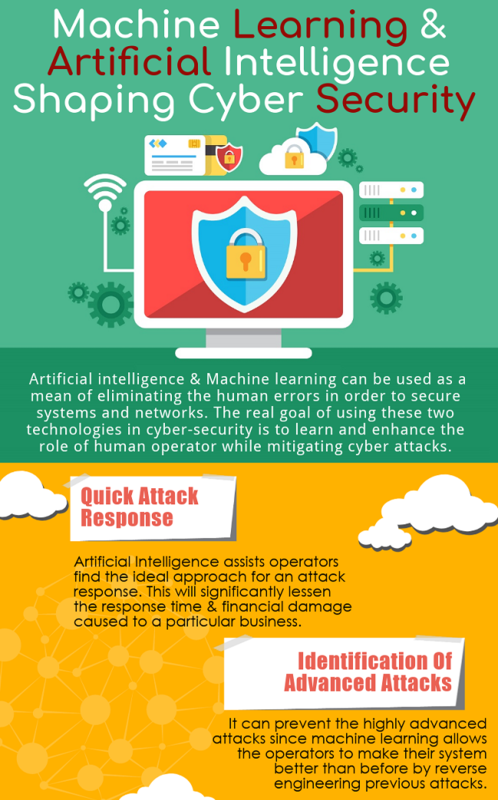 How Machine Learning and Artificial Intelligence Is Shaping Cyber Security. You might have encountered pop-ups asking for permission to access certain details whenever you install an app on your mobile phone. We generally accept to grant access and that’s where we expose ourselves to cyber vulnerabilities & threats. Location – All apps generally ask for permission to track your location. If you install an app that contains malware and if you give app permission to track your location, then cyber criminals can keep a check over your movement. Contacts – Some apps require you to allow them to gain access to your contact list. With this, you allow the app to see who all are in your “contact list” and what are their contact details. Apps can further use this information to market themselves. If hackers access this information, they can misuse the phone numbers, email ids of contacts known to you. Gallery – If you download an app that asks for permission to peek through your gallery, then ensure that it is from a trusted source. One needs to be wary of giving permissions to such apps as cyber-criminals can use your photographs or even ask for ransom to exploit you. Read the app description thoroughly and make sure that you comprehend on each and everything before actually installing the app on your mobile phone. Make sure that you download the app from a trusted source. If you are not sure, send an email to the developer and ask them about reasons why they require permissions. Download the app only if you are satisfied with their answers. Check out whether the permissions asked by an app are required or not. For e.g. if you download an app that monitors your eating habits and it asks for permissions to access your gallery, then it is better to give it a miss because gallery has nothing to do with your eating regime. The best way to ensure about authenticity of an app is to read the reviews of other people who have downloaded it. Read them thoroughly to gain an insight of complains or positive feedback about the app. Manage your account permissions using permission manager apps. They help you manage the permissions and disallow them to gain access to other apps that contain your personal information like gallery, contacts etc. Keep your phone updated and install a good anti-virus. Do not download the app that asks for too many permissions than what are generally required. It is extremely important to audit the app permissions every now and then to ensure that your personal and confidential information stays safe and private. For more information on IT Security, call Centex Technologies at (254) 213-4740.